Dwarka (Dvarka, Dwaraka, or Dvaraka, is a city and a municipality located in the Jamnagar district of Gujarat state in India). Dwarka also known as Dwarawati in Sanskrit literature is rated as one of the seven most ancient cities in the country. The legendary city of Dvaraka was the dwelling place of Lord Krishna. It is believed that due to damage and destruction by the sea, Dvaraka has submerged six times and modern day Dwarka is the 7th such city to be built in the area. According to Hindu legend the god Krishna built a city which was ultimately destroyed by rising sea levels. 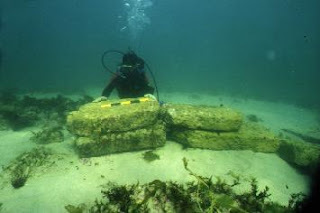 Now archaeologists and Indian Navy divers are investigating underwater ruins at Dwarka on India’s western coast, said to be Krishna’s city. The new efforts, it is hoped, will settle the debate currently raging over the age and authenticity of the site near the Samudranaraya temple. Divers have collected blocks and samples which will now be dated. Traditional Hindu scholars referencing ancient Hindu scriptures believe the location to be very ancient, originally built many thousands of years ago. Such notions are, of course, vehemently rejected by establishment scientists though they are willing to concede that there is evidence indicating an age of as much as 3500 years. Of course the date when the city was destroyed would be long after the date of its inception, so a definitive maximum date has not been established. The new study is expected to resolve some of the issues. Archaeologists will now use the carbon dating technique to determine the exact age of the ruins. The earlier excavations, that first began about 40 years ago, had only revealed stones, beads, glass and terracotta pieces. The first excavation in Dwarka, carried out by the Deccan College Post-Graduate and Research Institute, Pune and the Department of Archaeology, Government of Gujarat in 1963, had revealed artefacts that were 2000 years old. Several other excavations followed, all revealing different artefacts and to different time periods. Two years ago, the Underwater Archaeology Wing (UAW) of the Archaeological Survey of India undertook the systematic study of Dwarka and after thorough analysis of previous researches, started excavation work in January with the clear objective “to know the antiquity of the site based on scientific study of the material evidence.” The holistic nature of the excavations can be judged by the fact that for the first time “excavations were conducted simultaneously on land, near famous Dwarkadhish temple, and also offshore so that finds from all the excavations can be analysed, correlated and studied scientifically,” Tripathi said. Dwarka is among several coastal Indian sites now under investigation which show evidence of advanced development before sea levels reached their current height and thus provide significant evidence of pre-diluvian civilization—the existence of which is denied by conventional archaeology.